A second and rather lighter approach to Shay, Fireblossom’s, prompt on Real Toads to write a response to a painting by Gerda Wegener. 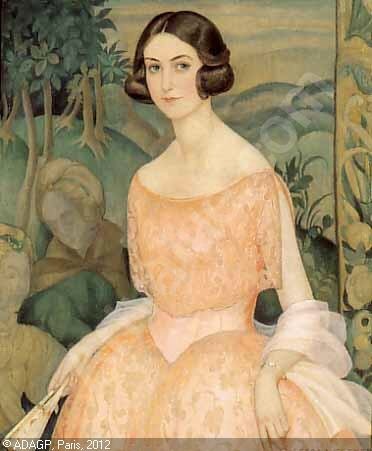 I confess that there was a particular Wegener painting of girl amusing or amused by a swan that I was thinking of, but I had a very hard time uploading it to my blog, and thought maybe I better stick, in any case, to a different Wegener image–the beautiful one above. Copyright may exist on the image–I will take down immediately on request. This entry was posted on January 1, 2016 at 6:58 pm and is filed under poetry, Uncategorized. You can subscribe via RSS 2.0 feed to this post's comments. Who can tell, with a swan? Not me! I suppose one must figure it out from its actions! And that good old swan ego! Her story about the bread. That cracked me up! I really enjoyed the point of view you have created – a more worldly wise interpretation of what went on between Leda and the swan. Thanks, Kerry. Your sonnet (link for others; http://kerryoconnorpoems.blogspot.co.za/2016/01/leda.html) was just beautiful. k.
A delightful ramble through the intricacies of attraction, and the pain of feeding something with a very snatchy beak.The internal rhyme really gives support and cadence as well as a song-like feeling(like a tune in the background) and the narrator seems not so very injured that she can’t ruefully reflect and move on. Agree it is a very beautiful picture choice–the shadowy faces behind her especially.I also think it picks up and weaves in the threads of Wegener’s own story very well. I especially like the swan understanding “the trick of not clipping wings”…and the feathery breast.